HOUSTON (July 13, 2018) – Mobil Steel International, Inc. performed a contractor industry safety “three-peat”, improving safety performance each of the past three years and earning increasing levels of outstanding safety performance recognition awards for three consecutive years. Mobil Steel picked up the distinguished Platinum level 2018 Safety Training Evaluation Process (STEP) program award sponsored by the Associated Builders and Contractors (ABC) national association at an ABC Greater Houston Chapter meeting July 13th at the University of Houston Hilton Hotel. Mobil Steel has advanced its level of safety performance each year, earning the Platinum designation STEP award this year after earning a gold designation in 2017 and silver designation in 2016. The safety awards are resulting in significant safety results, according to Leonard A. Bedell, President and CEO of Mobil Steel. On March 31st the company recorded two years of working safely without suffering an OSHA recordable injury – a workplace injury or illness that would require medical attention. Medical treatment which would create an OSHA recordable work injury can be as simple as prescription medicine. “Our employees have developed a culture of safety performance that has resulted in continuously improved safety performance. The direct evidence is working more than two years without being injured or becoming ill from a workplace accident,” Bedell said. Bedell also acknowledged that Mobil Steel awarded safety bonuses to employees at the end of June and formally recognized the safety milestone of two years worked without an injury at a Safety Award & Patriotic luncheon to celebrate safety and America’s Independence Day the day before the Fourth of July. Bedell is proud of his employees’ focus on safety performance while the company remains busy fabricating steel for an expanding refining and chemical industry and a busy commercial industry that continues to add schools, offices and retail outlets during a robust economy. “I am proud to say that working without an injury for more than two years and earning three consecutive National ABC STEP awards demonstrates that Mobil Steel employees have delivered on the promise of a safe and healthy workplace. The fact that we have done this while actively helping contractors and industry rebuild America’s petrochemical industry and kick-start the U.S. economy is even more fulfilling,” added Bedell. STEP is a safety benchmarking and improvement tool used by ABC members to measure, develop and continuously improve safety and training efforts that ensure worker well-being and health. The STEP program uses 20 key components to safety and health, as well as Occupational Safety and Health Administration (OSHA) standards and reporting requirements to evaluate members’ safety and health performance. 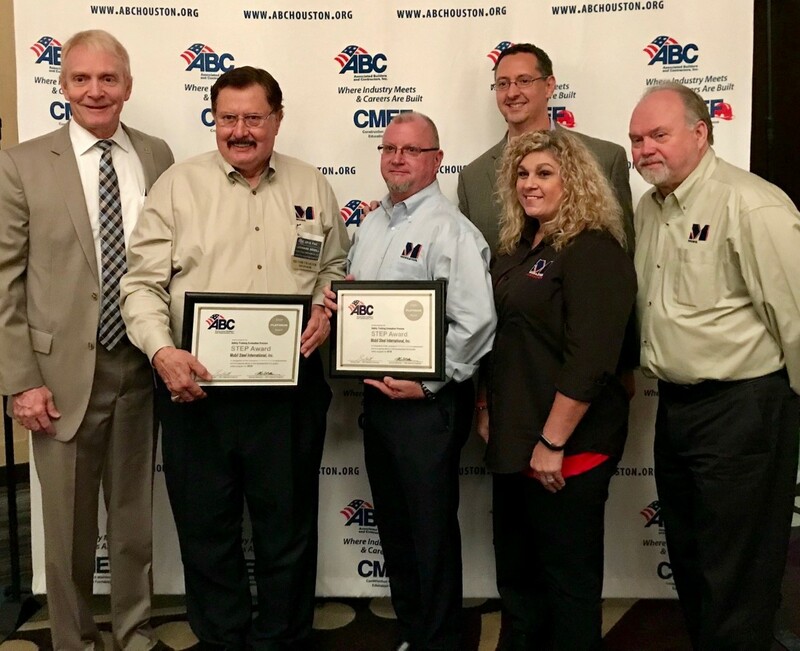 Mobil Steel and other local contractors and service companies were honored for STEP performance during a quarterly meeting of the ABC Greater Houston chapter on Friday, July 13th. In addition to the safety award recognition, the meeting included a presentation from an industry safety leader, Jim D. Wiethorn, P.E., Principal Engineer and Chairman of Haag Engineering, who shared safety tips, including work behavior and activity that contributes to accidents and how companies can reduce the risk of accidents. ABC National safety studies suggest that the 20 key components of the STEP program are leading indicators proven to improve safety performance, and that a company’s strong leadership culture alone improves safety by 50 percent. ABC National safety studies also note that ABC STEP participants perform better than Bureau of Labor Statistics national averages in safety performance metrics for the construction industry. A 2018 self-evaluation of Mobil Steel’s safety and health program confirms that the local steel fabricator continues to meet and exceed guidelines of the ABC STEP program. The self-evaluation results also demonstrate Mobil Steel’s commitment to safety and health through development and analysis of structured safety and loss prevention programs, and training to reinforce safety programs. “Mobil Steel and ABC share the core value of employee safety. Whether it is building an employee’s safety culture from the first day on the job or taking time each day to focus on safety, we build an expectation that at Mobil Steel we will work safely,” Bedell added. The STEP program was established in 1989 by ABC National’s Environment, Health & Safety (EH&S) Committee and developed and written by contractors for contractors. The program provides companies tools to improve safety with a goal to send every construction industry employee home in the same or better condition than which they arrived. Safety tools include sample safety manuals, safety plans, job safety and job hazard analysis, safety presentations, safety posters and job safety videos. The resources are developed by ABC members and partners. According to ABC, safety performance helps participants in the pre-bid and bid process for securing work and when negotiating cost-effective insurance rates. Mobil Steel leadership accept a Platinum 2018 Safety Training Evaluation Process (STEP) award for distinguished safety and health performance in the industrial contracting industry. From left, ABC Houston President Russell Hamley; Mobil Steel President & CEO, Leonard A. Bedell; Mark Scott, Mobil Steel General Manager; Steve Cote, BCH Insurance, risk management safety consultants to Mobil Steel; Sheri Henry, Mobil Steel Human Resources manager; and Rick Johnson, Mobil Steel Project Manager and Project Engineer.